Two designs to choose from and they are completely customizable! 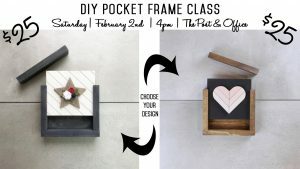 For $25, this class includes the purchase of the frame & pocket insert, however, we plan to have future classes to create just the pocket inserts for you to change out seasonally. This class is limited to 12 people and we have six of each design. Please RSVP and let us know the choice of insert design by visiting the Facebook Event Link below. First come, served.